I wasn't going to review Winter Ghost here because another reviewer from my review site, PODBRAM, officially read and reviewed the book for both PODBRAM and Amazon, but after reading the follow-up, McKenzie Affair, I thought I would add my two cents to this one, too. 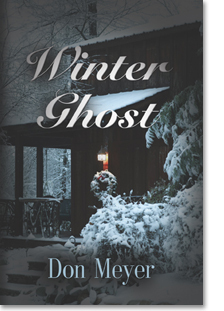 Obviously I liked both of Don Meyer's Tom Monason Mysteries better than Al Past, the author of the Distant Cousin Series, liked Winter Ghost. Dr. Past was quite a fan of Meyer's The Protected Will Never Know, but I am a fan of the Jesse Stone movies, a series quite similar to this book in plot, characters, and setting. Dr. Past and I agree that Mr. Meyer could practice his proofreading a little more, but that is my only complaint about McKenzie Affair or Winter Ghost. The sheriff of a small town up in the mountains of (I assume) northern California is called to the scene of a bizarre murder mystery and the plot ensues as the clues unravel at a quick pace. Don Meyer doesn't waste a lot of energy on detailed descriptions or character development with pages of words. He gets right to the point of the story through lots of dialog and specific action. You might describe the story line of Winter Ghost as Andy and Barney move to Twin Peaks, losing their funnybones on the way. I recommend, but only mildly, that anyone read Winter Ghost before McKenzie Affair. You will already have an introduction to the characters and setting if you read Winter Ghost first, but only a little of the plot of McKenzie Affair is tied to the details exposed in Winter Ghost. The cover of Winter Ghost was selected as the best of the year at PODBRAM. If only the editing and proofreading were as good as the cover and story, Winter Ghost would get an easy five stars from me! Start with a frozen naked woman "looking" in the window of a vacation home, hands on the glass. Call it an accidental death. Add in reports of an unknown woman visiting the home on subsequent weekends. Season with two more couples dying after visiting the home, a sheriff (Tom Monason), new to the small nearby town, several deputies, and a bar owner, and you have, in addition to a ghost story, the makings of a murder mystery. Winter Ghost attempts such a recipe, and a promising one it is. I have some experience with the mystery genre, yet I cannot think of another example to compare it to. As the story is carried out, however, it never seized my interest. Beyond a few personal quirks, the characters were thinly developed, the setting was generic (beyond snow, a small town, and a bar), and the ultimately simple story line was strewn with stylistic infelicities. That's a shame, because Mr. Meyer's other book reviewed on this site, The Protected Will Never Know, the memoir of a soldier during the Vietnam conflict, was excellent. Narrated through the eyes of an unprepared, naive young soldier, the style fit perfectly: the reader is able to see between the lines to share the frustrations and terrors of a pointless war. As a memoir it was not entirely fiction, and that was its strong point. Pure fiction must create the reality the reader needs to be fully at home in a story, and Winter Ghost did not adequately do this for me. For the general reader, The Protected Will Never Know gets my vote as the more definitely recommended of the two.